Father Time will forever remain undefeated, but UFC middleweight king Anderson Silva (Pictured) plans on giving Mr. FT a run for his money. Following Saturday’s UFC 155 post-fight press conference, UFC president Dana White announced Silva, who turns the ripe age of 38 in April, is set to ink a 10-fight contract extension to remain with the planet’s premier mixed martial arts promotion. Last month, Silva’s manager, Ed Soares, said his client had two bouts remaining on his current deal. White didn’t specify whether Silva would be tacking on 10 additional scraps to the two he has left or if his new agreement cancels out the previous contract. In any event, it will be interesting to see if the UFC’s most decorated champion will complete his new deal. Especially when you consider the fact Silva has only competed twice each year since 2009 and doesn’t intend on returning to action until late 2013. 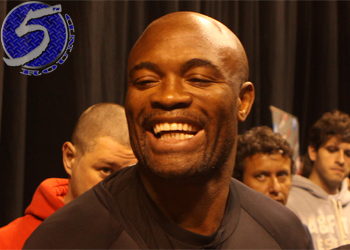 At Silva’s current pace, he’ll be pushing 44 if he intends to fulfill his new contractual obligation with the UFC. “The Spider” owns a UFC record 10 consecutive title defenses and is perfect through his past 17 scraps. The Brazilian hasn’t lost a fight in nearly seven years, and he avenged the controversial disqualification by steamrolling Yushin Okami at UFC 134. He was last seen steamrolling Stephan Bonnar at UFC 153 in October.